For Robert Livingston, the owner San Francisco’s newest grand emporium, the holidays are shaping up to be a dismal failure if he can’t figure out how to stop whoever is stealing from his department store, the Silver Strike Bazaar. When he hires the Dawsons to investigate, Annie and Nate discover that behind the doors of Livingston’s “Palace of Plenty,” nothing is quite what it seems. 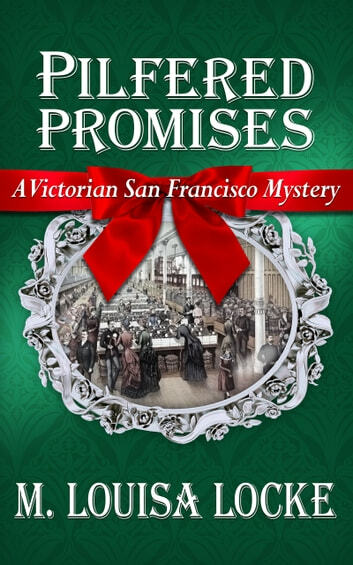 Pilfered Promises, by USA Today bestselling author, M. Louisa Locke, is the fifth full-length historical mystery in the cozy Victorian San Francisco mystery series featuring Annie and Nate Dawson and their friends and family in the O’Farrell Street boarding house. 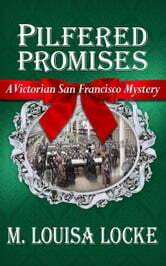 Locke’s shorter works, found in Victorian San Francisco Stories and Victorian San Francisco Novellas, feature minor characters from the series. Yes I do like this authors writhing style, when I read her books I can picture it all in my head, I get into the book as if I is there. I absolutely loved this whole series and hope to see more followups. Locke has done her research so we are treated to real insight into the San Francisco of the late 1800s while being thoroughly entertained by a great mystery. Even though I figured parts of it early, there was still plenty to keep me guessing until almost the very end. She has created characters you can't help but love, and is always a joy to catch up with them in the next book. I like Victorian stories usually. Parts of this one didn't ring true as the lead character was well outside the boundaries set on women in the period, starting with her ownership of the boarding house.